Fast food is a reality of my life. I drive, I eat. Often I drive and eat food that tastes only moderately worth the calories I’m consuming. 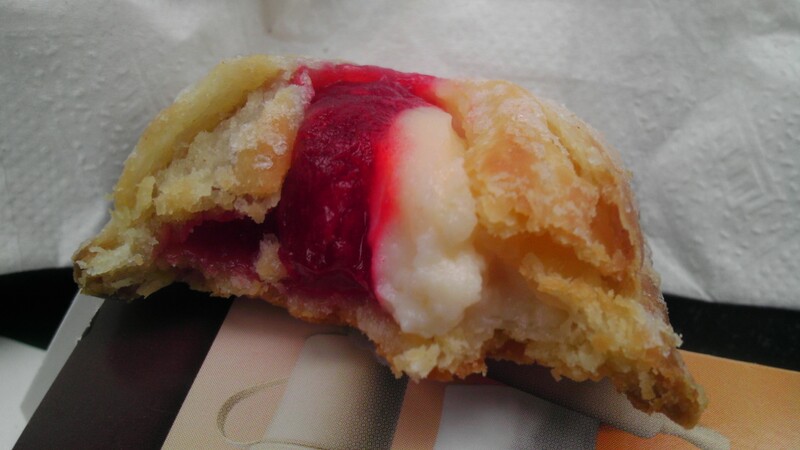 Not so with McDonald’s limited-time offering, the Strawberry Cream Pie. Even typing it I realize it sounds improbable. A tasty cream pie from McDonald’s? Cream and heat lamp do not shout logical partnership. Until you bite into one. The Strawberry Cream Pie manages to combine the tastes of a strawberry cheesecake with the best of McDonald’s ability to crisp up fat. And, unlike the Sugar Cookie pie, which was offered during the Christmas holidays, I was not left wondering what chemical cocktail had created the sensation of flavor. Each bite of the Strawberry Cream pie offers a combination of strawberry and cream cheese in perfect proportion to the crispy, flaky taste of buttery crust. As an added bonus, this pie is drive-thru safe. No burning, oozing cherry filling incidents here.